Arroz à grega (Portuguese pronunciation: [ɐˈʁoˌza ˈɣɾeɣɐ], "Greek-style rice") is a Brazilian dish, consisting of rice cooked with raisins and small pieces of vegetables, the most common of them small cubes of carrot, green peas, sweet corn and spring onions, albeit broccoli (Italian or "American") is increasingly seen. It can get small bits of ham, sausage and/or smoked turkey breast, among other processed meat supposed to be eaten cold, but if e.g. chicken meat or shrimps are used, irrespective of whether the rice's texture matches any closely the traditional Italian recipe, it is instead known as risotto (a rustic one, given how raisins are not such a common use to other Brazilian savory dishes and it tends to not mix two different kinds of meat). 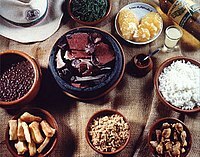 Most often, it is done with the more typical style of cooking rice – the country's prime staple food – in Southeastern Brazil. This following rice recipe assumes average Brazilian conditions: it should last as food proper to human consumption for at least 2 days in room temperature at ~25–30 °C, and at least 4 following days at fridge temperature of 5–8 °C (plain rice from a fridge might be more prone to criticism, as it tends to lose flavor quality with domestic refrigeration directly at its pot). Rice taken from a fridge should be heated in its own individual serving amount, but rice that is still not in a fridge (or will not get to it at all) is still out of recommendation to be re-heated whole. Objects manipulating rice before being put to a fridge especially should be clean with at least a soapy substance, a residues remover soaked in it and running water; preferentially, sterilization methods safe to human domestic use are more efficient. Also, important to note is that the more biological seasoning – except for herbs with antimicrobial activity – a boiled rice pot gets, the more perishable it gets. This is especially true, in general, for vegetables with a higher water content (thus fried onion bits make rice more perishable than ground garlic sofrito, for example, taking into account them being added in similar cooking periods – whether 1. fried before the rice is added to their pot 2. added after the rice's frying is complete 3. added while the rice is boiling 4. added after the already boiled rice is dry, ready to eat). With the smallest possible trace of water (dried at room temperature in the case it is washed; effects of using a microwave to make the drops and wetness evaporate might not be desirable), it is put to fry in vegetable oil (a practice known as refogar, literally "to make a sofrito") before adding salt, it should be over 100 °C upon adding table salt, water at room temperature is added only a few instants before the rice is almost going to burn, it should be always stirred to make sure the ones at the bottom of the pot do not enter combustion. When water is finally added, it should be given generously, and the rice is then finally put to boil (do not stir it any more time, unless it is desired to make another dish with this rice that includes some form of previously boiling sauce still exposed to heat); in the case it evaporates before the rice is at a texture appropriate to human chewing, more water should be added when noises of vapor bubbles heard coming from the bottom turn more violent than usual as rice finding the overly heated pot contributes to the sounds (it sounds a bit more like deep-frying, though with a more sultry and less "watery" characteristic to the sound). Heating is lowered a bit before such a process starts, preferentially (some 5–10 minutes, practice gives use to the right time). The second water pouring is added not generously (otherwise it can give a soppy, sticky texture to the rice, aside a brick state, what is especially prone to fungal spoiling – especially so since it should get less heating than the boiling process –, as would putting it to boil a third time to warm it; the standard style rice should ideally be as floppy and al dente pasta-like in texture as it gets), and a kettle is put over the pot. It is done merely with the intent of making the rice at the bottom of the pot not burn. Most of the cooking from now on would actually be steaming rather than boiling. Some people prefer to preemptively add a little less water to the boiling process (without a kettle) to make sure the first water pouring does not last too long and the bottom rice does not get burned while the heating is still considerably high. A small opening should be made separating the kettle from its correct position a few millimeters or centimeters for some 3–8 minutes before the heating is turned off, to make sure the steam gets out and does not condense afterwards (as has been mentioned previously, there are various problems associated with leaving a "Brazilian" rice too wet) and/or continues to cook the rice past the right point. Most of the difference in arroz à grega recipes surrounds around the right time to which the raisins, vegetables and often meat is added to the rice, and whether they are all fried together previously or not. Other differences include what is added to the rice before the raisins and vegetables (might include garlic, onions, biological coloring and even lentils, soy sauce, MSG or rosemary), how the rice is cooked, and obviously, what to add to the rice. Given the many differences between ingredients in such a dish, Brazilians expect the rate of spoiling to be likely higher and instead of lasting at least 2 days out of a fridge as plain rice is generally purposed as, arroz à grega can be stored in refrigeration in the same day it is done. Also unlike plain rice, it can be purposed to be eaten cold. This page was last edited on 26 November 2018, at 19:57 (UTC).